Thorn Histmage is an epic Scout creature card. It is part of the Core Set. "Feel the power within you." "By the power of the Hist!" The card's health was formerly 5. This was decreased in Patch 1.69.0. 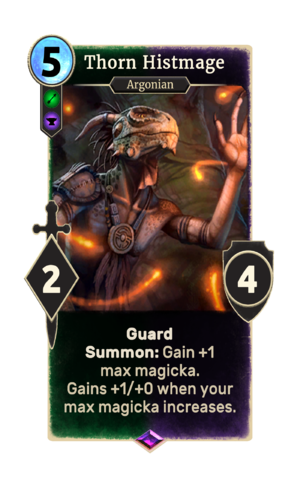 The card's ability applies the Magicka Rising card effect. The card is named for the Black Marsh city of Thorn. This page was last modified on 25 February 2019, at 01:19.